More than £66 billion of taxpayers' cash invested in RBS and Lloyds may never be recovered, a spending watchdog has warned as it criticised the Treasury for making a series of costly mistakes in its handling of Northern Rock. Officials were slow to react to the banking crisis because they lacked the necessary skills and understanding, according to the public accounts committee. That made losses on the Northern Rock rescue, which auditors earlier this year estimated would cost £2 billion, difficult to avoid, MPs said. Margaret Hodge, who chairs the committee, said the sale of the bank was handled well but still led to a loss for taxpayers of nearly half a billion pounds. Just two bidders were interested in taking it over, sparking fears that the two remaining state-backed banks, RBS and Lloyds, will fail to be sold for a profit. Mrs Hodge said: "The rescue of Northern Rock is expected to cost the taxpayer some £2 billion. The Treasury was unable to respond promptly when the banking crisis hit because it lacked the right skills and understanding. It was slow to nationalise the bank and that made a loss difficult to avoid. "The Treasury had spent five months trying to find a private sector buyer before giving up. After nationalisation, it then failed to effectively challenge the optimistic business plan put forward by the bank's management to split the bank." The run on deposits at Northern Rock in September 2007 was one of the pivotal moments in the financial crash. After nationalisation, the bank was split into Northern Rock plc and Northern Rock (Asset Management), which held its bad debt. The move was supposed to generate lending but it fell well short of its £15 billion target, reaching just £9.1 billion. Earlier this year, the Treasury's most senior official, Sir Nicholas Macpherson admitted the taxpayer lost out because of five months of "drift" as the crisis unfolded. The Treasury has accepted its part in a "monumental collective failure", according to the report. It has now set up a dedicated team, UK Financial Investments (UKFI), to manage taxpayer shares in banks. A Treasury spokesman said: "We will provide a full response to this report in due course. 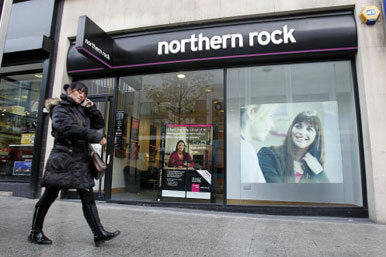 The decision to nationalise Northern Rock in 2008 was taken in the interest of financial stability. The sale of Northern Rock plc to Virgin Money last year represented good value for money for the taxpayer, and has helped increase high-street competition."